Fans of Sonic seem to be endless, and just as endless is the supply of Sonic-fan-items for you to see! What creative objects will everyone come up with this time? Why are these NOT bootlegs? Because their owners are not trying to pass these off as official goods, and in most cases, there is only ONE of each item you see. No one's in some factory somewhere mass-producing things only hoping to grab money. 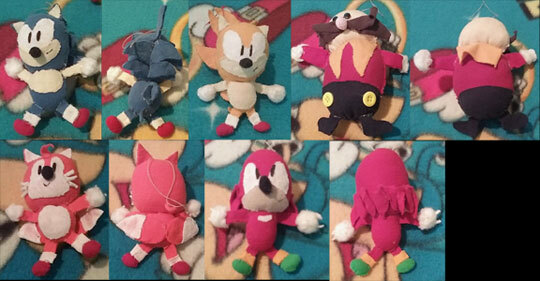 Most of these are crafts created by Sonic fans, will they inspre you? Can a company be a fan? It looks like that's possible... because it seems like fast food Arby's is! They have made 3D items including a Pumpkin Hill pumpkin, and a Master Emerald base. Then, the photos were added to their official Twitter with a Sonic-related message. All that combines to land these funny photos here on fan objects. First, Knuckles is ready to go to Pumpkin Hill Zone (near halloween, it was a shout-out to fans) then, Eggman steals the emerald-shaped nugget (notice his egg o matic has "BEEF" written on the side) & last, Knuckles regains the nugget item & is shown with onion-ring "rings. What's unique about it. They're not doing a Sonic promotion of any sort, they didn't need to make the fun little decorations or shout out to the Sonic fans. They are just BEing fans...having fun and promoting at the same time. 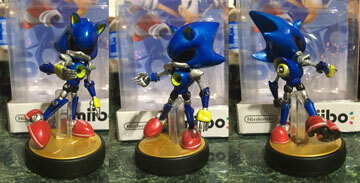 Here is a customized Amiibo base...into Metal Sonic. 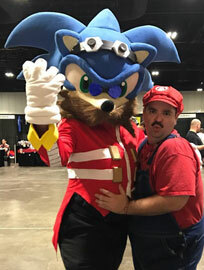 Sonic the Cosplay is at it again with another wacky 'double costume'. This Sonic-suited fan dresses up the literal Sonic suit into various characters for double the fun. This time, the suit is dressed as modern style Eggman complete with gloves, jacket, mustache, little glasses & work goggles. It looks like a Mario cosplay is getting in on the posing action as well, at (probably) a convention. 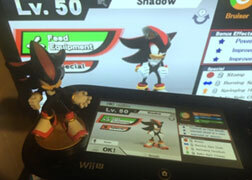 Photo owned by: Sonic the cosplay An Infinite fan figure! 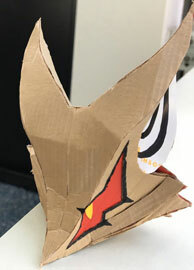 The villain from Sonic Foces, calling themselves "Infinite", has quickly been made into a fan figure since an official one wasn't made upon the game's release. 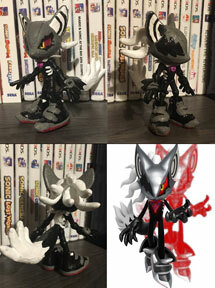 This is made from Jazwares 3.75 line figures Jet’s head, Shadow’s body, Silver’s hands and Sonic’s free rider shoes, along with new paint, sculpting for the wiggly spikes & tail. All of the articulation still works & the figure can stand on its own. All photos & customized by Dustin Lee Autry. Here is a fan-made charm. Thanks to the bead-loop at the top it can be added to an item with a wire or a loop, in this case it's on a Sonic themed notebook. 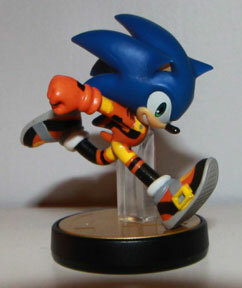 The charm is a little Sonic figure made of colored clay. 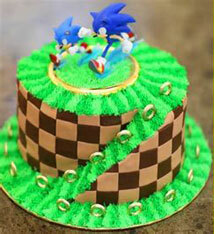 Photo & made by Sonic Dollz A Sonic Generations cake! This cake uses the Jazwares Generations display figures on ring base as a cake topper. It has been filled with green frosting to match it to the cake. The cake is a nice looking GHZ theme, complete with path of rings leading up to the top. Fondant is used to make the checkered ground. This fun cake with video game like path looks like a gift & cake in one! But who's is it? Here is a fan-customized figure. It's Tomy's classic style Metal Sonic, but with some paint details added. While classic MS had shorter limbs, it was not shorter on detail. Some silver-tone marker makes a metallic paint job (that Tomy just had as gray) , plus colored in the jet boosts on how they should be. If you remember all the way back to Sonic Adventure 2 Battle, after a while you could get some extra content for the game which you could use to dress up the characters in suits from Sonic Team's other game at the time, which was the ORPG PSO Phantasy Star Online. In this case, Sonic got the 'default' HUmar (A male melee class hunter) suit that you could have him wear in the game as a fun extra. It also promoted PSO* a bit too. 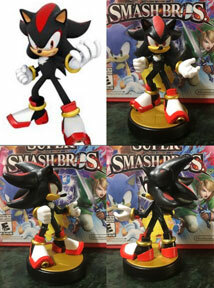 This person has customized their Sonic Amiibo so that it looks like it's wearing the suit just like in the original extra content of the game. (Other characters got other PSO costumes to wear too, like Shadow got the HUcast (an android hunter) armor plate & Rouge had HUnewearl (a hunter newman) outfit) But who has customized this Amiibo? *PSO was actually one of SonicTeam's greatest contributions to anything ever. 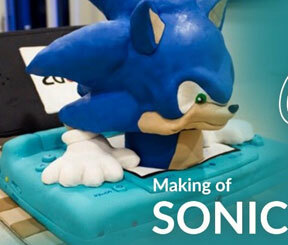 Here is a professional Sonic cake. 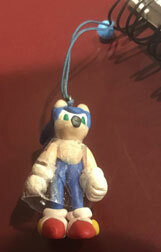 This is NOT a 'fan item' because it was not made by a Sonic fan. It was hired-made by a professional bakery. That means bakers & cake decorators were given a picture of a 3DS & also of Sonic and paid to make a cake combining the theme. It was a fun idea, turning 3D into actual three dimensions having him popping out of the screen. That said, it's too bad they dropped him on his face before the cake could be presented. The eye is bent where he hit something, and the whole bottom of the face area is distorted and caved in. Because cakes like this use Fondant, dropping them will generally bend, compress, or 'moosh' rather than crumble or tear because it is like clay. This photo is by "Cake Outside The Box" but the photo suffers from an odd crop. Which means people can make their own floats of whatever they think is cool and add them to a parade. 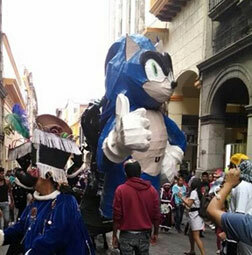 In this case, it looks like someone really likes Sonic and has made a paper mache fan-float of him that's really pretty big! He's doing a thumbs up, and is clearly modern style. He's got all 5 fingers but....whoops, there goes the blue arms. A fan made effort is still appriciated by the parade attendees though, as everyone's watching him go down the street and a person is taking a picture too. It's cool to see Sonic celebrated in lots of places, year after year.